Andrew Bradford OLIVER (1818-1877) the youngest son of Benjamin OLIVER (1765-1831) of Killynure contested the will of his older brother, William OLIVER (abt1809-1873). The problem lay in the will of Benjamin OLIVER (1765-1831) which had not been rewritten since the birth of Andrew, his youngest son. When Knockagraphy was sold in 1880, legal opinion was that “Ben and John OLIVER” should have each received a third. One assumption (based on a great deal of circumstantial evidence) is that Ben was a son of Andrew Coulter OLIVER. This is likely true, but I still do not know who John was. My hopes is that by setting this in a chronological format, others can take these kinds of questions one step further. The will was dated March 22, 1813, before the births of his last three children. Benjamin OLIVER bequeathed all my property of any nature and kind soever and wheresoever situate both real freehold and personal unto Thomas SIMPSON, who was a Flour Merchant on Thomas Street. I am assuming that the bequest was a legal formality, with Thomas SIMPSON acting as executor. I note in a family history of the KIDDs, that John KIDD (1737- 1808) mortgaged or sold his share of the Crewley farm, Knockraven, to John Thomas Simpson and Thomas Dobbin. According to a trade directory, John Thomas SIMPSON was a flour merchant on Thomas Street. NOTE: There must be a legal reason for doing it this way, but I do not have a clue what it might be. His goods and chattels were to be sold to cover his debts, and funeral costs excepting specific bequests and the goods that his wife had brought into the marriage including all the articles of furniture which she brought to me of her own or which were her own property before our own intermarriage. If there was not enough, and only then, the rents issues and profits of my landed properties could be used to cover debts. Any surplus was to be put out to interest for the benefit of his two sons: Thomas & William. They were also to get a feather bed bedstead curtains blankets and bedding complete may be reserved for each of my two sons which was not be sold by Auction along with the rest of my furniture. For his wife was the benefit of leased land in Maghery Kilcrany leased to him by Dillon POLLARD, a landowner who was the High Sherriff of Westmeath in 1798. This was a lease held by Benjamin OLIVER since 1804. SEE: January 14, 1804 CARSON-OLIVER. His trustees and heirs were delegated to ensure that the trusts were honoured. The townland of Killynure was deeded in trust to his son William OLIVER leased with toties quoties covenant of renewal under John Pringle as was one half of his lands in Knockagraphy which he had purchased from Rev. Francis GERVAISE and for which he had free title (NOT a lease). William was restricted from mortgaging or encumbering or selling any portion of the property. If William was to die without lawful issue, then Killynure was to go to his brother Thomas. Benjamin’s son Thomas was to receive the other half of his freehold in Knockagraphy, as well as his farm in Lisdrummond held by a lease to Roger FORDE. It would then also fo to any of his lawfully begotten children. If Benjamin’s children had no lawful issue, then the assets were to go to Benjamin’s brother William OLIVER and James OLIVER and his brother-in-law James McCULLAGH and their heirs. His executors were empowered to make leases [to his sons until they reached the age of majority] of the freehold properties hereby bequeathed to them respectively for 3 lives or 31 years determinable and of my chattel properties for 21 years determinable - but with a few caveats. His executors were also to expend any sum not exceeding £40 annually on the maintenance clothing and education of each of my said two sons until they shall respectively become entitled to possession of the premises. This was to be deducted out of the surplus of investments, which was then to be split when his two sons turned 21 or were married. The 1813, 1825 & 1832 documents are all on page. This was a draft of a Deed of Declaration of Trust. The day and month were never filled in. It is between Benjamin OLIVER and his brother William OLIVER, gentleman and his brother-in-law Andrew Coulter BRADFORD of Cavananore. The purpose was to provide a pension for his two daughters Elizabeth and Mary Jane OLIVER, both minors. Two bonds of £200 each were set up for them and in case they shall both die without being lawfully married the said Bond and Warrant and also these presents and everything therein and herein respectively contained shall be utterly null and void. NOTE This is the ₤400 secured by a Draft Deed unexecuted "& which has proved as Testamentary" mentioned in the will abstract in the National Archives. It was to be used as a jointure should the daughters marry. Mary Jane never married. July 1 Benjamin OLIVER died. March 1 Proving of Benjamin OLIVERs will. Andrew Coulter BRADFORD of Cavananore was appointed the Guardian of the minor aged children: Thomas, Elizabeth, Andrew, and Mary Jane OLIVER. Only William OLIVER jr was of full age at the time of their father’s death. The children’s uncles William and James OLIVER were executors. The eldest of the children, William OLIVER was then to administer and dispose of all and singular the goods rights credits and chattels of the said deceased and to perform the said will and deed of Trust and to pay the debts and legacies of the said deceased as far as such goods rights and chattels will thereunto extend and the Law charge as also to make a true free and perfect inventory of all and singular the goods rights credits and chattels of said deceased and to exhibit the same and also to render a true free and perfect account thereof unto the said Court when thereunto lawfully required. Other than the ₤400 trust for his sisters, the assets were: Inventory included ₤42.7.6 in Housegoods; ₤1000.0.0 in leases; ₤553.13.3 in securities; ₤150.14.0 in stock and ₤2.0.0 in cash for a total of ₤1748.14.9. The particulars on file with National Archives mention farms of Killynure, Lisdrummond & Magherkilkrany. William OLIVER leased from the Vicars Choral of Armagh Cathedral with his brother Thomas 55 acres and buildings valued at £6.10.0. 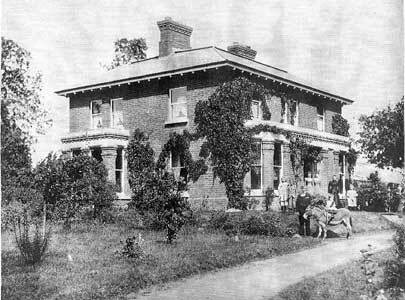 William OLIVER also owned in fee 24 acres at Knockagraphy. May 4. Thomas OLIVER died. Revision Books show lease by Thomas and William OLIVER from Church Temporalities (previously Vicars Choral of Armagh Cathedral). 55 acres and buildings valued at £6.10.0. October 15. William OLIVER died. November 11. Probate of will of William OLIVER. The living children of his brother Andrew Bradford OLIVER, and the children of his sister Elizabeth JACKSON are all mentioned as residual legatees, receiving his assets in equal shares, except for £50 to go to his housekeeper, Sarah Rock. William COUSER & William MENARY were appointed as executors. William MENARY died the following February leaving COUSER as the sole executor. Given that family documents say that William OLIVER died unchurched which is not the same as unmarried it is possible that Sarah Rock was more than a housekeeper. SEE: Catholic OLIVERs in Armagh. NOTE: Sarah ROCK was likely related to the Margaret ROCK who married a John OLIVER, from whom many of the OLIVERs currently living in Armagh descend. November 12 Your Uncle Andrew is ill pleased about his Brother’s will; he will give trouble if he can, but I hope it is not in his power. …Johnny is going about home as usual. I fear the legacy will put folly in his head; but you will be at home (D&) before that comes. Did I tell you that some of my children hoped to buy Uncle Wm’s freehold property [Knockagraphy], a sort of joint stock company; which would give a yearly income to each? Well, Johnny objects to put in his share, but wishes to have in ready money. If he continues in that action, it will just be the old story of the prodigal son over again. But as I said, you will be at home, and your advice may have weight. June 8 I hope to go to Killynure tomorrow; and shall write you all my news either from there, or when I return. We will do our best to avoid the “sharks” if possible but your late correspondent is the very lad who would fling us among them, if he had the means. Your resolution to leave his letter unanswered is perfectly right, and for your life, do not give him a shilling. Anything he can lay hands on, is surely spent either on [law?] or whiskey. The other two brothers; though they were not what they should have been yet had some redeeming qualities but this one is an unmitigated brute. This is the truth; but Aunt Mary does not like to hear it. I was puzzled to think how he got your London address. Ben must have given it to him for surely no one else would. October 15 A letter from Eliza to her son Thomas: Your Uncle Andrew has made a formal declaration of war, or rather law. He has noticed Mr McCombe not to proceed with selling or dividing Uncle William’s  property, till the case is tried. He has been going about ever since he came home trying to get some lawyer to take up the case on spec, but did not find anyone willing to do so; but now he has prevailed on Ben to produce the needful, promising to give him Killynure, as soon as it is won. Ben came up to consult Aunt Mary, but returned without doing so. He promised to write to her; but no letter had arrived last Sabbath. She and Andy dined in Liscalgot that day. She intends to be quite [neuter?] in the matter. I think she is right. If they win any part of the property, they will have it. If they do not win, they will have the satisfaction of having done the best; so let them see it out. It will all be as God pleases, and even if it goes against my brother’s will; what my children never had, they never lost. Just this day twelve months, dear William departed this life. If he could have foreseen the work that is going on, he would have been an angry man. I feel very thankful that he got leave to die in peace; which would not have been the case, had his [?lty] brother arrived a few days sooner. Revision Books. Killynure was first listed as in fee and owned by Thompson Brown. March 17 MENARY-JACKSON In 1867 William MENARY sr. left his lands to William MENARY jr. who then married Mary JACKSON in 1871, and the lands of Maghery Kilcranny were put into a marriage settlement for Mary JACKSON. William MENARY jr had then gone to his solicitor to arrange that the lands would be charged with a jointure of £30 a year if he predeceased his wife, with the lands themselves going to their issue. The lawyer’s clerk made an error, omitting the clause that would have left the land to the daughter. Then William MENARY jr. died intestate, after the birth of his daughter, Mary MENARY, at which point the error was found. William Robert FERRIS, a creditor of William MENARY sr., argued that in the absence of the pertinent clause coupled with an intestate death, the lands should be sold. SEE: 1872 Probate of William MENARY d 1867. April 24. The decision was made August 16, 1875. See beneath. April 28. Account in the Irish Times of Couser vs Oliver. The case was filed for the administration of the will of William OLIVER. He had bequeathed his property to William COUSER and William MENARY in their roles as executors. He had leased Killynure and Enagh from the Vicars Choral and Organist, but had accepted an offer to purchase the lease. The executor wished that the trust of the will be carried out. August 10. Eliza writes to her sister Mary Jane. The subtext is that the two sisters do not communicate that well, and Eliza is doing her best not to offend. She only learned of Mary Jane’s plans to lease out Cavananore from a newspaper ad. She suggests her son Andrew Coulter Bradford JACKSON to be the lessee. · November 24, 1875 The answer of Mary Jane OLIVER. The court declared that the trusts are to be executed as outlined in Williams will. October 3rd. Mary Jane OLIVER died. Her will dated January 27, 1875 included bequests for her brother Andrew OLIVER and his daughter Margaret of £100 each, and for his two surviving sons, Benjamin and Bradford bequests of £50. Her niece Martha had predeceased her, but Martha’s daughter Mary Jane NORRIS received £100. Thomas JACKSON was appointed executor and residual legatee, and his mother Eliza was repaid a £150 loan. November 27. Andrew Bradford OLIVER died. 1880 July 17 Belfast Morning News. The lands of Lisdrumard, Knockagraphy and Drumgar are sold. July 21 According to promise, I write to inform you of the sale of the Oliver estate which was appointed for Friday the 16th inst. We had no idea that it would be sold at all; times were so bad, and so many properties offered for sale; without a bidder; yet it was sold, and well sold, all things considered ₤2350 was what it went at. I have received a note from Thompson Brown, since then which surprised me a good deal. He says that it never was legally [deeded?] that Ben and John Oliver should get the third of the property, and that the case should be argued again before the Vice Chancellor. I suppose Mr McCombe to be the author of this opinion; though Thompson did not say so; and whether it is a bona fide advice; or whether it is only another seven years wait and more law costs; I cannot say. May the Lord direct whatever is best. I expect Thompson here today; when we will hear more particulars, and discuss the affair. NOTE: There is a possibility that this is the John OLIVER (1841-1909) who married Margaret ROCK. William OLIVER's housekeeper was a Sarah ROCK. John was Catholic, and it is likely that he had converted from the Protestant faith since his wife was Catholic. November 2. Uncle William’s estate is not yet wound up; there is a dispute at law with the tenant Mrs. Knipe, & until that is decided, the assets cannot be divided. Much luck could not come of that property; the owners neither feared God, nor pitied the poor; but I hope and pray that there may be a blessing in what remains of it. My poor Father did the whole mischief by not making a new will; when the increase of his family required it. I need not tell you to avoid that error; for I believe you have avoided it. 1881 April 14 Margaret OLIVER, daughter of Andrew Bradford OLIVER died. Thompson BROWN was her executor. Effects £364.5s.8d. Revision Books. The valuation of the buildings leased by Thompson BROWN rose from £8.10.0 to £17.0.0. This indicates to me that the new house had been completed. · The Revision books show Mary Anne MULLEN sr. had a lease for 6 acres and a very modest building(s) (value 10s) in 1892 that had previously been leased by Sarah and Mary DONAGHY. They are on lot #1.
o It is curious that 1892 is also the date of the death and will of Mary OLIVER “wife of William OLIVER”, who left her lands at Killynure to Mary Anne MULLEN. Is it possible that Sarah DONAGHY was the out-of-wedlock daughter that Mary Anne MALLON had with a William OLIVER? · The revision Books show that in 1908, this lot was purchased in fee by Joseph MACKLIN. o Transcript of will: 19 January 1892. Killynure. In the year of our Lord eighteen ninety too [sic] this is my last Will and Testmont [sic] by the Grace of God I bequeath my houses and farm and cattle cows and calves and all I am possessed of to Mary Anne Mullen Mary [X her mark] Oliver. Witnesses present: Robert Montgomery, Killnure. Owen Fegan Killnure. Affidavit of due Execution files A. Nelson. District Registrar. Will Annexed 23 Feb 1892. NOTE: The death certificate of Mary OLIVER who died on Jan 24 1892 at Killynure at age 70 and was the wife of William OLIVER, a labourer was signed [X - her mark] by Mary Anne MULLEN. I also note that both Mary Anne MULLEN and Mary OLIVER signed with an X. Whether they were illiterate, or simply too frail or whatever, I cannot say. · Mary Anne MULLEN and a William OLIVER (no residence given) had two children together: Benjamin born August 21, 1841, and Sarah born August 31, 1844. It is possible that these two children were raised by their mother, or by other members of the extended family. Also worth noting is that a William McCULLY took over a lot leased by John McCULLY. I suspect that he was a son of John McCULLAGH and Jane OLIVER. In the mid 1920s, the same land is owned by an Elizabeth McCULLY.